Intarsia techniques truly set encaustic painting apart from other painting mediums. It is a technique that borrows from wood, clay, metal, or fiber intarsia where a different color material is physically inserted into the base color or surface. It is an exciting technique with a distinctive appearance, one that often leaves the viewer scratching their heads and wondering, “how did they do that?!”. It is a technique best employed when you want crisp edges and contrast, with a smooth surface. To begin, I brushed on several layers of color- blue and green, for variety- and fused the surface with my heat gun. Then I let the wax cool down. I tried to get the surface as smooth as I could. You’ll see why in a moment. If you are a true perfectionist, you might want to take a single blade razor, and, holding it perpendicular to the paint surface, lightly scrape it until it is level. Next, I incised the surface with a variety of tools. From left: a small exacto knife (the outline of the smaller flower), a plastic clay tool (the wavy shallow lines in upper right), two more metal clay tools (wide strip far right), an awl (used to draw larger flower, write with, and make dotted lines at lower left), a sewing tool (wavy dotted lines lower center), a fork (lower right), and above, a set of numbers originally used for imprinting sheet metal (center). You’ll want your designs to be fairly deep, and flick off any large burrs of wax that may curl at the edges of your wax. If you make a mistake, you can usually re-fuse and start again when the wax cools. Next, I brushed on a contrasting color of encaustic paint, filling in the designs in the wax. I used a vivid yellow, just to make this easy to see. Sorry if this is hurting your eyes! You may find that if your paint is really hot, you start melting your underlayer with your brush strokes. In this case, turn down your palette heat a bit, and use more of a dabbing motion than a brush stroke. Either way, you want to fill those incisions. After letting all of the wax cool to room temperature, take your single razor blade and carefully start scraping the surface, keeping your blade at approximately a 45 deg. angle. remove the curls of wax as they build up on the razor, or they will stick to the painting when you least want them to. It is not showing all that well in the photograph above, but the result is color inlayed into the wax, with a nice level surface. I’ve left the left side of the flower unfilled to demonstrate another technique later. I’ve also left the lower right portion only partially scraped back, so that you can see what it looks like mid-scrape. It can be a nice effect, with a little halo of color around the marks, and random areas of color. Also, you see little bits of yellow here and there- that is where my surface was not absolutely level. Paint settles into the low areas, and I had to stop scraping before they were gone, or I might have lost too much of the design. At this point, you can keep on adding layers, and building your painting surface. Keep in mind that if you fuse heavily right after using this technique, you will lose the crisp lines, and your design will melt together. Also, sometimes different colors melt at slightly different temperatures, so this can cause a mess. With some experimentation, you will learn when to stop. I usually fuse very very lightly, or add a few layers of clear wax before fusing to protect the design. I hope this is helpful! I’ll continue the intarsia technique next time, with a slightly more advanced approach. This entry was posted in beeswax, encaustic, encaustic technique and tagged beeswax painting, encaustic, encaustic color, encaustic intarsia, encaustic painting, encaustic technique on June 15, 2009 by LisaK. Oh yes! I forgot about this technique. I usually fill my incisions with oil bar or oil paint. I’m going to try this out again. Thanks for your posts! I just found you through the Encaustic Twibe that I just joined. Thanks for providing such a clear demonstration of this technique. This is very, very helpful! I now have a name for what I have been doing! My first experiments with encaustic have been in combination with oil media and I have carved, scraped and embedded different oil media into the surface. It feels like ancient memory to me ( one of my pieces). I am so happy to have found a link to your site. I will be reading more! Hi Lisa. I found your site surfing the net. I am an Encaustic artist and currently writing my first book on Encaustic Art to be ready by April 2011. I found this technique fascinating. What support did you do your picture on? Is it canvas or board? I am so surprised, I actually just used this technique not knowing it had a name.I do small wood carvings and used my small v shaped gouge.Filled in the lines with wax. I love this technique. Most inspiring! Thank you for showing step by step – it really helps understanding! Hi Pam, I’ve never had any problem with a painting destabilizing from intarsia. If you think this may be a concern for you, you may want to try substituting another technique, such as hand-cut stencils, so that the imagery would sit on the surface and be easily fused. beginning to work in encaustic. This post is SO helpful! Will look for others of your post s.
Very interesting technique. 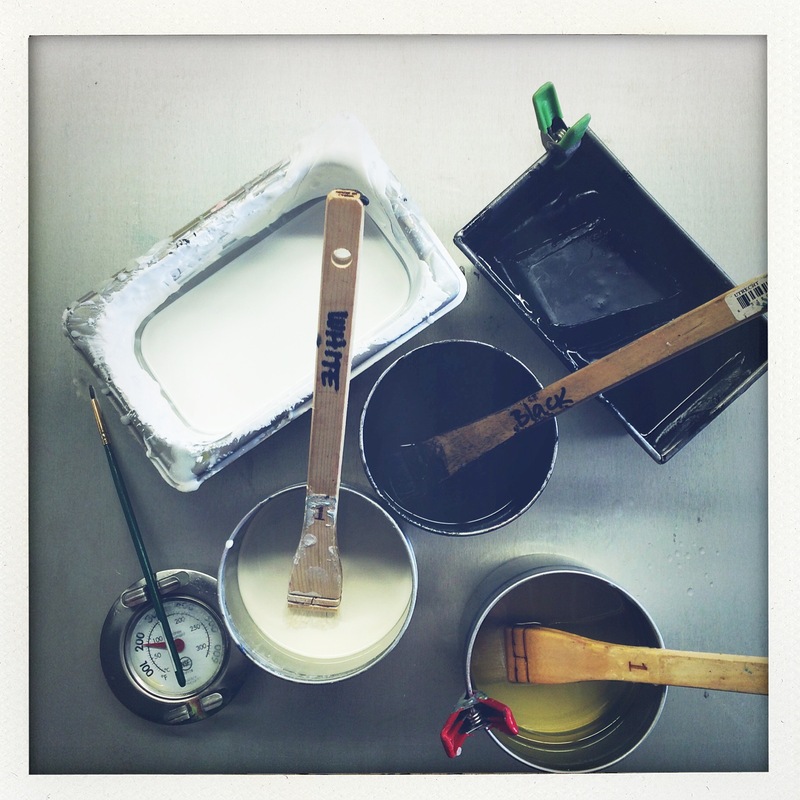 I’m just beginning to work in encaustic & this post is SO helpful! I will look for other posts of yours. hi. I was wondering how to get rid of the pin dots on my encaustic surfaces. thank u.